Nifty opened positive on the back of good global cues, and gained strength with each passing hour with huge long build-up to close around the highs of the day at 5842.20, a huge gain of 159.85 points. On a week-on-week basis the index gained 174.55 points or approx 3.08%. The broader market was also very good, with 974 advances to 337 declines. Option Table saw huge support building up around 5700 level with highest addition for the day at 16.84 lacs. 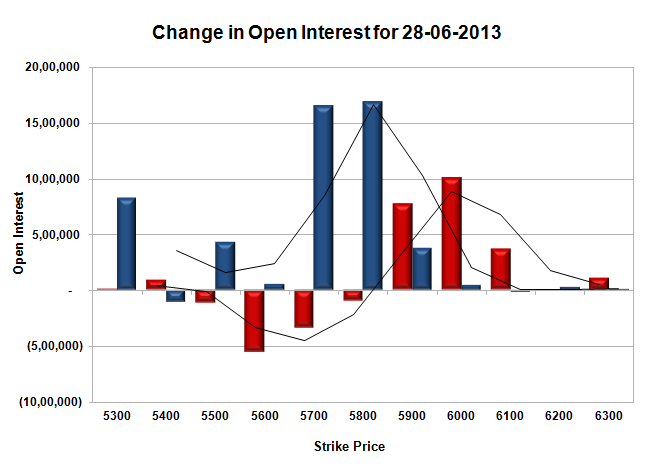 Call option 5900-6100 added 21.42 lacs huge amount of OI with short covering seen at 5800 and lower prices. Put option 6000-5500 added 42.37 lacs huge amount of OI with some addition seen at 5300 level. Highest accumulation on Call option 6000 at 42.59 lacs & 5900 at 40.51 lacs whereas Put option 5600 at 60.02 lacs & 5700 at 47.88 lacs. 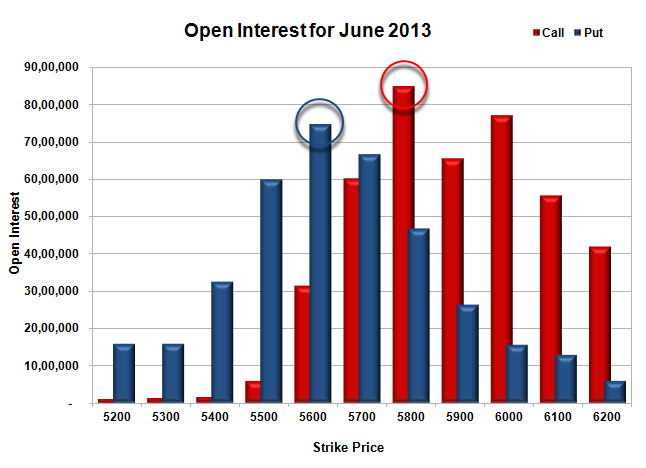 Nifty Open Interest is at 1,43,32,450 up by 24,16,000, with increase in price, most probably long build-up. Bank Nifty Open Interest is at 11,65,400, down by 7,375, with increase in price, most probably small short covering. FII’s bought huge 29.23 lacs Futures, most probably long build-up, as their net OI increased by 61026 contracts and the average price per contract comes to around 5839.60. FII’s future open contract as on date is 316223. PCR Open Interest (Volume) has gathered momentum and is now at 1.374. Initial support at 5800, with huge addition for the day at 16.84 lacs and below that at 5700 with huge OI of 47.88 lacs. 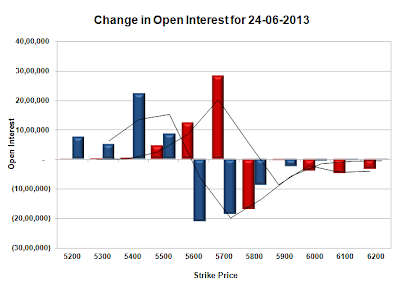 Initial resistance at 5900, with huge OI of 40.51 lacs and above that at 6000 with OI of 42.59 lacs. Range as per Option Table is 5748 - 5895 and as per VIX is 5787 - 5897 with 5820 as the Pivot. Nifty opened positive on the back of good global cues, and huge short covering rally saw the index end the June expiry just below 5700 level at 5682.35, still a huge gain of 93.65 points. The broader market was also positive, with 696 advances to 591 declines. 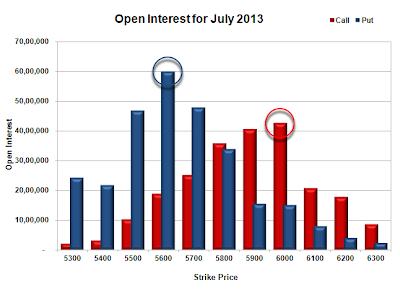 Option Table at start of series looks balanced around 5700 level with a range developing around 5500-5900. Call option 5200-6200 added 50.78 lacs huge amount of OI. Put option 5700-5200 added 42.87 lacs huge amount of OI with small addition seen at higher levels. Highest accumulation on Call option 5800 at 36.80 lacs & 5900 at 32.78 lacs whereas Put option 5600 at 59.47 lacs & 5500 at 42.44 lacs. 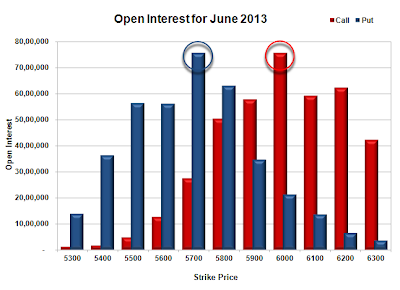 Nifty Open Interest is at 1,19,16,450 up by 20,89,650, with increase in price whereas June series saw huge short covering. Bank Nifty Open Interest is at 11,72,775, up by 4,00,300, with increase in price whereas June series saw huge short covering. FII’s bought 0.72 lacs Futures, most probably short covering, as their net OI decreased by 321225 contracts and the average price per contract comes to around 5680.50. FII’s future open contract as on date is 255197. PCR Open Interest (Volume) at start of series is in a healthy position at 1.250. Initial and best support developing at 5600, with highest OI of 59.47 lacs and below that at 5500 with OI of 42.44 lacs. 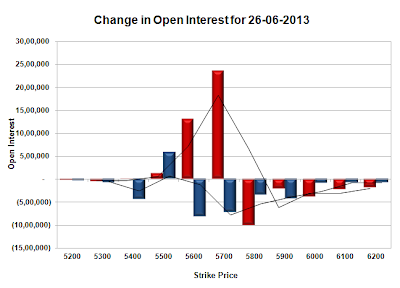 Initial and best resistance at 5800, with huge OI of 36.80 lacs and above that at 5900 with OI of 32.78 lacs. 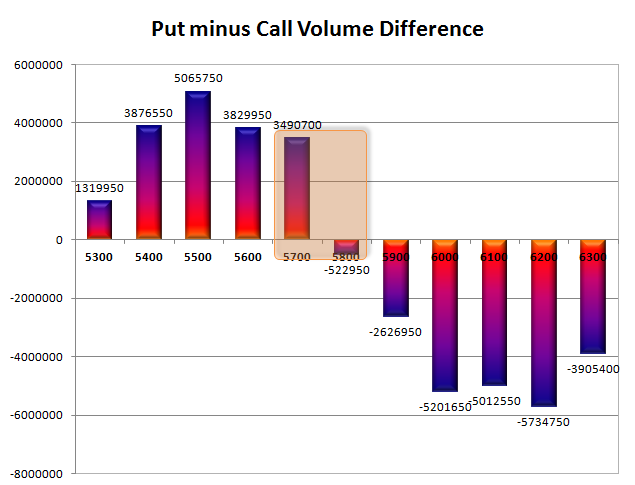 Range as per Option Table is 5609 - 5741 and as per VIX is 5626 - 5738 with 5680 as the Pivot. Nifty opened flat to positive, and stayed in a narrow range of 30 points for the better part of the day, but saw huge selling in the last hour to close around the lows of the day at 5588.70, a loss of 20.40 points. The index has closed at the low point of the series below the psychological level of 5600 just before expiry. The broader market was also weak, with just 449 advances to 839 declines. Option Table looks fully in control of the bears. Call option 5500-5700 added 37.83 lacs huge amount of OI with profit booking seen at 5800 and above strike prices. Put option 5500 added 5.78 lacs huge amount of OI with short covering seen at 5600 and above strike prices. Highest accumulation on Call option 5700 at 1.13 crore & 5600 at 70.02 lacs whereas Put option 5500 at 77.38 lacs & 5600 at 63.47 lacs. Nifty Open Interest is at 1,65,25,300 down by 26,10,000, whereas July series added 21.28 lacs with small decrease in price, most probably rollover with huge long liquidation. Bank Nifty Open Interest is at 12,02,950, down by 2,96,050, whereas July series added 3.63 lacs with decrease in price, most probably 100% rollover with huge short build-up in July series. FII’s bought 1.01 lacs Futures, most probably short covering, as their net OI decreased by 10674 contracts and the average price per contract comes to around 5581. FII’s future open contract as on date is 576422. PCR Open Interest (Volume) is at the lowest of the series at 0.702. Initial and only support at 5500, with OI above 77.38 lacs. Initial resistance at 5600, with huge addition for the day at 13.06 lacs and above that at 5700 with highest OI of 1.13 crore. Range as per Option Table is 5533 - 5662 and as per VIX is 5527 - 5650 with 5600 as the Pivot. Nifty opened flat to positive, but saw a dip towards the lows of the day around 5570, where the responsive buyers took control and moved the index above 5660. The seller seemed waiting for the rise and sold huge to move the index back at 5600 level to close just up at 5609.10, a small gain of 18.85 points. The broader market though was weak, with 513 advances to 775 declines. Option Table is perfectly balanced around 5600 level. Call option 5600, 5800 added 5.34 lacs huge amount of OI with profit booking seen at 5900 and above strike prices. 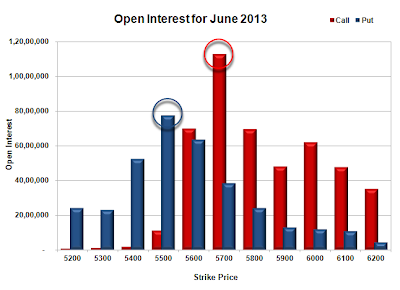 Put option 5600-5500 added 3.43 lacs huge amount of OI with short covering seen at 5700 and above strike prices. 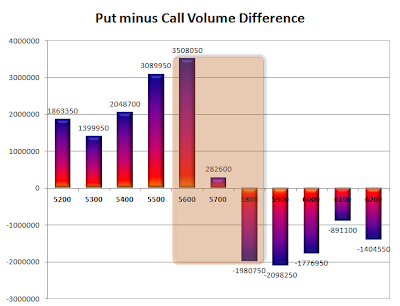 Highest accumulation on Call option 5700 at 89.33 lacs & 5800 at 79.83 lacs whereas Put option 5600 at 71.64 lacs & 5500 at 71.60 lacs. Nifty Open Interest is at 1,91,35,300 down by 16,11,150, whereas July series added 24.50 lacs with small increase in price, most probably 100% rollover with huge short added to new series. Bank Nifty Open Interest is at 14,99,000, down by 84,800, whereas July series added 1.38 lacs with decrease in price, most probably 100% rollover with huge short build-up in new series. FII’s sold 10.31 lacs Futures, most probably short build-up, as their net OI increased by 49973 contracts and the average price per contract comes to around 5611. FII’s future open contract as on date is 587096. 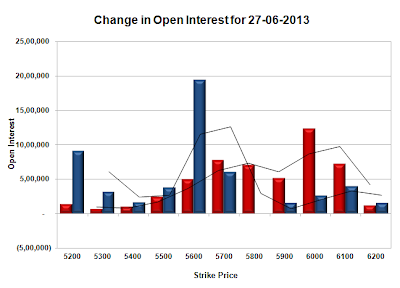 PCR Open Interest (Volume) is going down every day and now at 0.774. 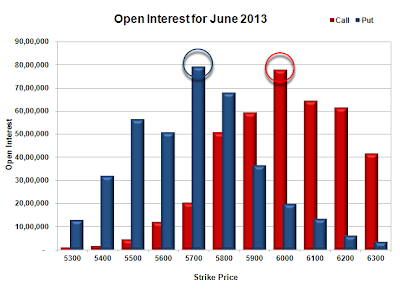 Initial support at 5600, with OI above 71.64 lacs and below that at 5500 with OI of 71.60 lacs. Super resistance still at 5700, with highest OI of 89.33 lacs and above that at 5800 with huge OI of 79.83 lacs. Range as per Option Table is 5546 - 5680 and as per VIX is 5547 - 5671 with 5615 as the Pivot. Nifty opened very weak on the back of bad global cues, and stayed weak throughout the entire session of trade to close below the psychological level of 5600 and shed 77.40 points. A small pullback towards the end saw the index close at 5590.25, after making a low of 5566. The broader market was very weak, with just 212 advances to 1093 declines. Option Table saw huge addition at 5600-5700CE level and now 5700 level seems like “Wall of China” for the Bulls. 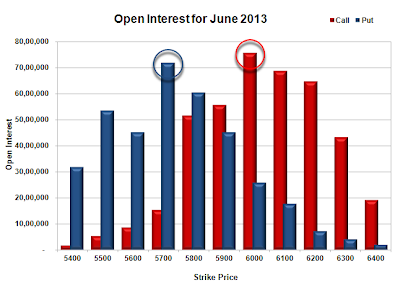 Call option 5500-5700 added 45.26 lacs huge amount of OI with profit booking seen at 5800 and above strike prices. Put option 5500-5200 added 43.45 lacs huge amount of OI with short covering seen at 5600 and above strike prices. Highest accumulation on Call option 5700 at 94.39 lacs & 5800 at 77.86 lacs whereas Put option 5600 at 69.96 lacs & 5500 at 69.84 lacs. Nifty Open Interest is at 2,07,46,450 down by 5,09,850, whereas July series added 21.85 lacs with decrease in price, most probably 100% rollover with huge short added to new series. Bank Nifty Open Interest is at 15,83,800, up by 77,600, whereas July series also added 0.92 lacs with decrease in price, most probably huge short build-up in both series. FII’s sold just 0.56 lacs Futures, most probably short build-up, as their net OI increased by 48371 contracts and the average price per contract comes to around 5592. FII’s future open contract as on date is 537123. PCR Open Interest (Volume) at the lowest point of the series at 0.778. Support at 5500, with OI above 69.84 lacs and below that at 5400 with OI of just 58.78 lacs. Super resistance right now at 5700, with highest OI of 94.39 lacs and above that at 5800 with huge OI of 77.86 lacs. Range as per Option Table is 5530 - 5662 and as per VIX is 5529 - 5652 with 5610 as the Pivot. Nifty opened very weak on the back of bad global cues, and immediately dipped towards 5616, which happens to be long term trend line support, and saw the buyers getting active to push the index towards 5700 level. Europe opening saw Nifty again going down but ultimately closed positive at 5667.65, a small gain of 11.75 points. The broader market though was negative, with just 437 advances to 852 declines. Option Table saw the 5600PE coming back, but it’s still highly Bear dominated. 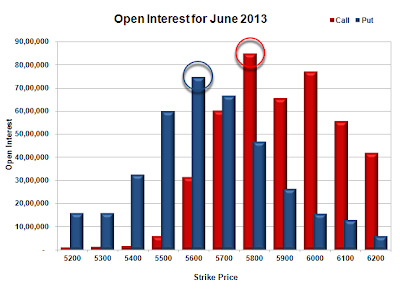 Call option 5600-5800 added 25.35 lacs huge amount of OI with profit booking seen at 5900 and above strike prices. 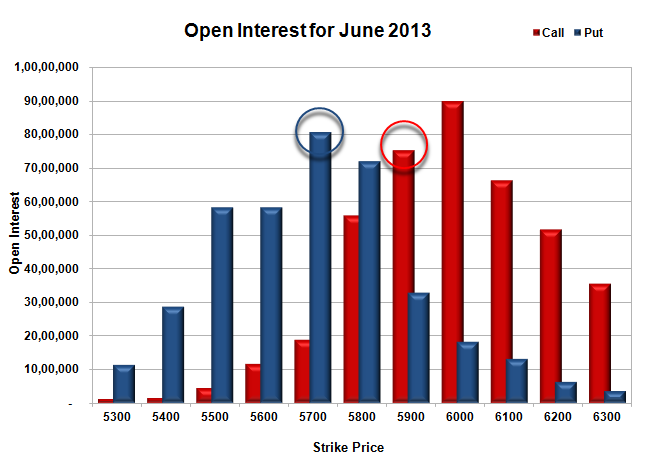 Put option 5700-5200 added 28.70 lacs huge amount of OI with short covering seen at 5800 and above strike prices. 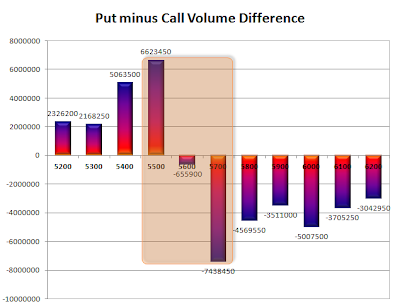 Highest accumulation on Call option 5800 at 94.78 lacs & 6000 at 71.95 lacs whereas Put option 5600 at 91.01 lacs & 5700 at 69.09 lacs. Nifty Open Interest is at 2,12,56,300 down by 2,77,700, with increase in price, most probably some short covering. Bank Nifty Open Interest is at 15,06,200, down by 29,200, with decrease in price, most probably some long liquidation. FII’s sold 4.74 lacs Futures, most probably long liquidation, as their net OI decreased by 5458 contracts and the average price per contract comes to around 5665. FII’s future open contract as on date is 488752. PCR Open Interest (Volume) just inched up to 0.813. Best support at 5600, with OI above 91.01 lacs and below that at 5500 with OI of 61.28 lacs. 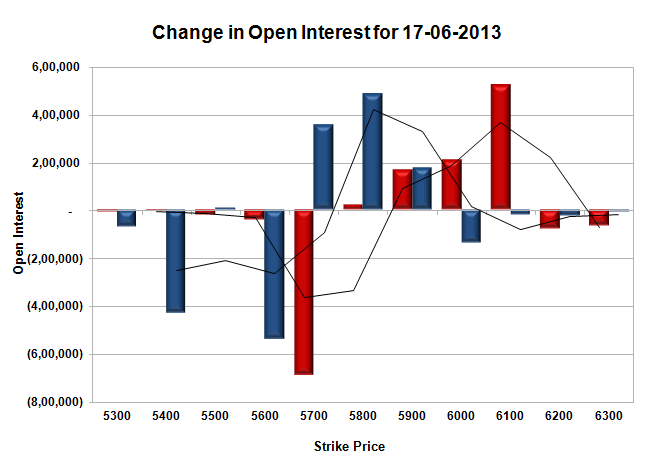 Initial resistance right now at 5700, with huge OI of 66.17 lacs and above that at 5800 with highest OI of 94.78 lacs. Range as per Option Table is 5599 - 5722 and as per VIX is 5611 - 5724 with 5670 as the Pivot. Nifty opened very weak on the back of global cues, and immediately went below the psychological level of 5700. Nifty tried to move up but drifted down with passing hour to close at the lowest of the day at 5655.90, a huge loss of 166.35 points, one of the biggest sell-off seen in recent times. The broader market was also very negative, with just 211 advances to 1090 declines. Option Table has been taken over by the Bears with Bulls running for cover. Call option 5500-5900 added 91.65 lacs huge amount of OI with profit booking seen at 5900 and above strike prices. 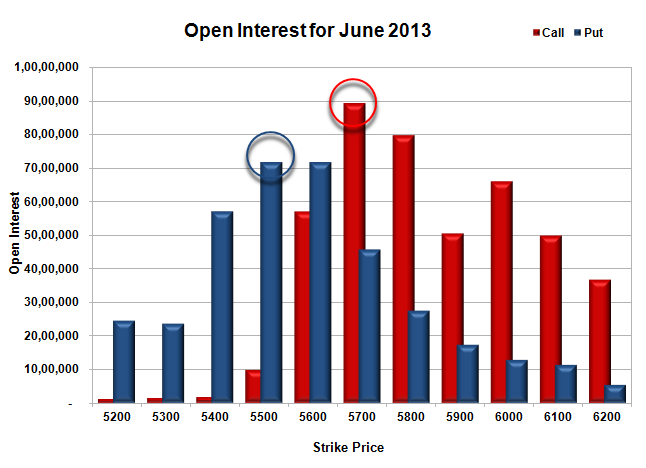 Put option 5600-5200 added 29.43 lacs huge amount of OI with short covering seen at 5700 and above strike prices. 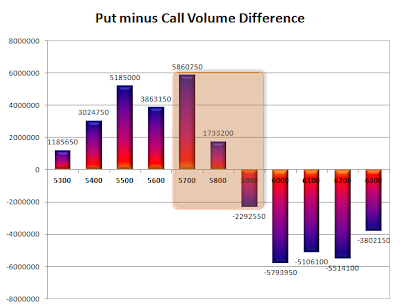 Highest accumulation on Call option 5800 at 84.87 lacs & 5900 at 65.46 lacs whereas Put option 5600 at 74.67 lacs & 5700 at 66.74 lacs. 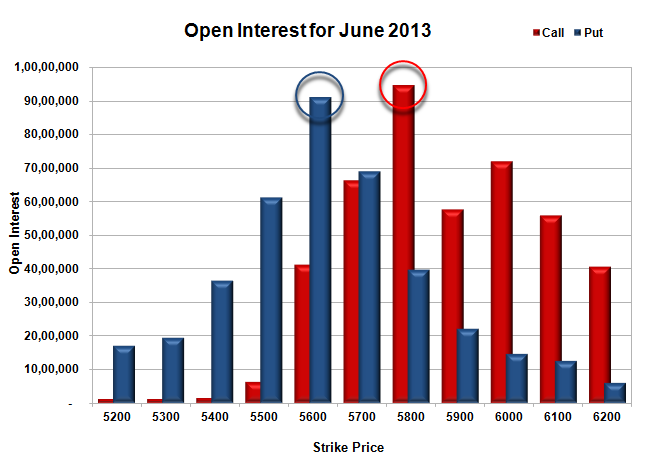 Nifty Open Interest is at 2,15,34,000 up by 29,99,850, with decrease in price, most probably huge short build-up. 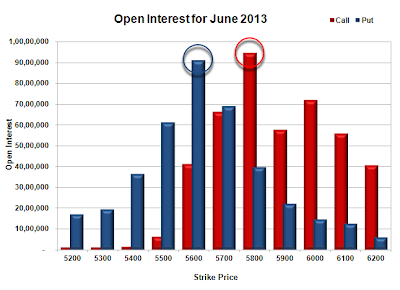 Bank Nifty Open Interest is at 15,35,400, up by 2,05,425, with decrease in price, most probably huge short build-up. FII’s sold 18.74 lacs Futures, most probably short build-up, as their net OI increased by 58195 contracts and the average price per contract comes to around 5654. FII’s future open contract as on date is 494210. PCR Open Interest (Volume) is at the lowest of the series at 0.796. Initial and best support at 5600, with OI above 74.67 lacs and below that at 5500 with OI of 60.06 lacs. Super resistance right now at 5700, with huge addition for the day at 41.34 lacs and above that at 5800 with highest OI of 84.87 lacs. 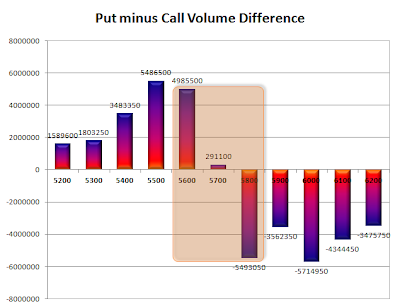 Range as per Option Table is 5617 - 5740 and as per VIX is 5599 - 5713 with 5690 as the Pivot. Nifty opened weak, and went on to touch the lows of the day around 5780 within the first hour itself, but saw the responsive buyer coming back to move the index above positive territory to close around the highs of the day at 5822.25, a very small gain of 8.65 points. The broader market was also positive, with 687 advances to 585 declines. Option Table range has come down to 5700-5900 with 5800 acting as Pivot. Call option 5900-6100 added just 5.89 lacs of OI with huge short covering seen at 5800 and below strike prices. Put option 5800-5500 added 16.51 lacs huge amount of OI with short covering seen at 5900 and above strike prices. Highest accumulation on Call option 6000 at 89.99 lacs & 5900 at 75.19 lacs whereas Put option 5700 at 80.60 lacs & 5800 at 72.12 lacs. 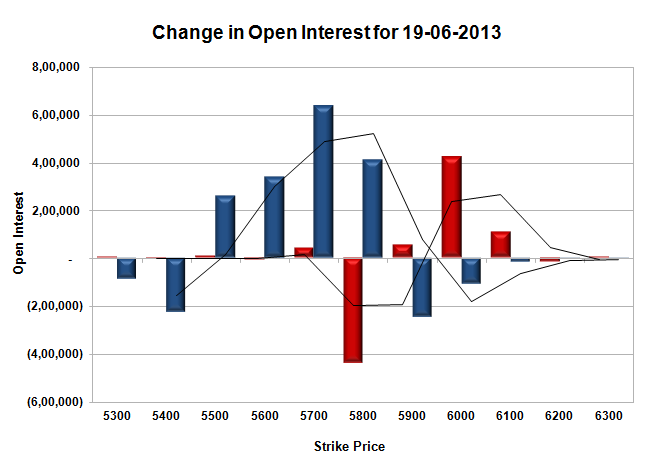 Nifty Open Interest is at 1,85,34,150 up by 7,34,850, with not much change in price, most probably huge short build-up. 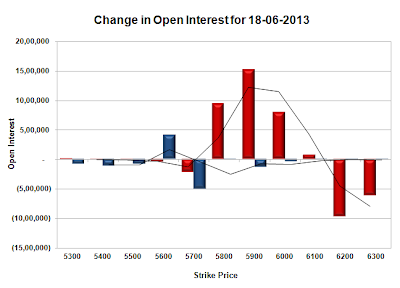 Bank Nifty Open Interest is at 13,29,975, down by 3,250, with increase in price, most probably small short covering. FII’s sold 6.20 lacs Futures, most probably short build-up, as their net OI increased by 14688 contracts and the average price per contract comes to around 5834. FII’s future open contract as on date is 436015. 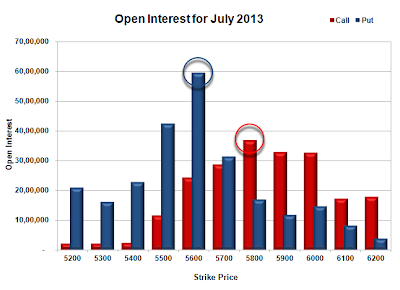 PCR Open Interest (Volume) is still in danger zone at 0.907. Initial support at 5800, with OI now above 72.12 lacs and below that at 5700 with huge OI of 80.60 lacs. Super resistance right now at 5900, with huge OI of 75.19 lacs and above that at 6000 with highest OI of 89.99 lacs. 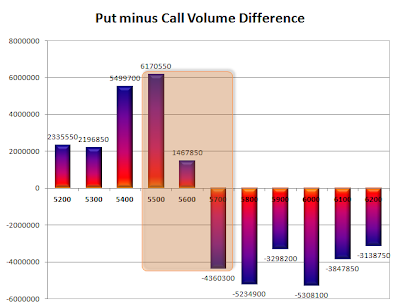 Range as per Option Table is 5754 - 5871 and as per VIX is 5766 - 5879 with 5830 as the Pivot. Nifty opened weak, and stayed weak for the better part of the day with only up-move around the second half sold huge with the index closing around the lows of the day at 5813.60, a huge loss of 36.45 points. The broader market was just negative, with 633 advances to 642 declines. Option Table is back to Bearish mode, with 5900 adding more than 15.1 lacs. Call option 5800-6100 added just 33.31 lacs of OI with huge profit booking seen at 6200 and above strike prices. Put option 5600 added 4.08 lacs huge amount of OI with short covering seen at 5700 and above strike prices. 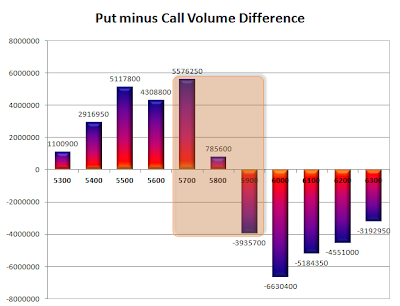 Highest accumulation on Call option 6000 at 85.76 lacs & 5900 at 74.64 lacs whereas Put option 5700 at 74.24 lacs & 5800 at 68.00 lacs. 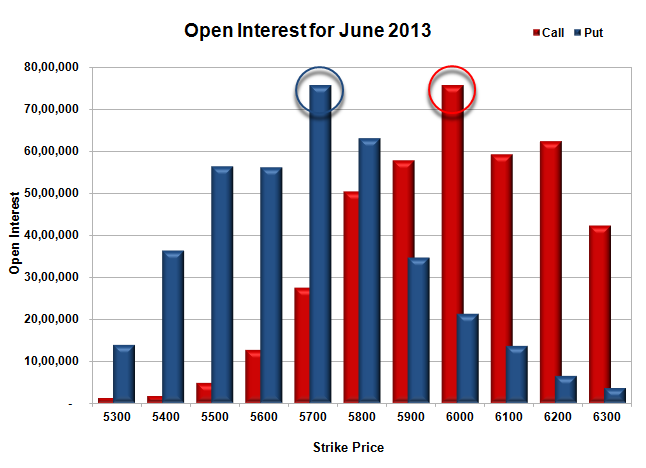 Nifty Open Interest is at 1,77,99,300 up by 7,57,600, with decrease in price, most probably huge short build-up. 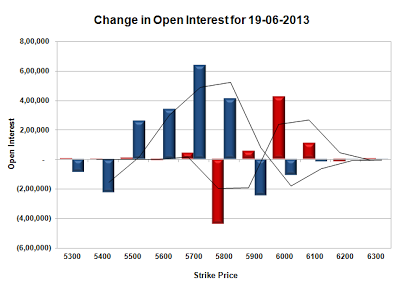 Bank Nifty Open Interest is at 13,33,225, up by 71,550, with decrease in price, most probably huge short build-up. FII’s sold 5.50 lacs Futures, most probably short build-up, as their net OI increased by 23064 contracts and the average price per contract comes to around 5823. FII’s future open contract as on date is 421327. PCR Open Interest (Volume) has gone to the lows of the series at 0.885. 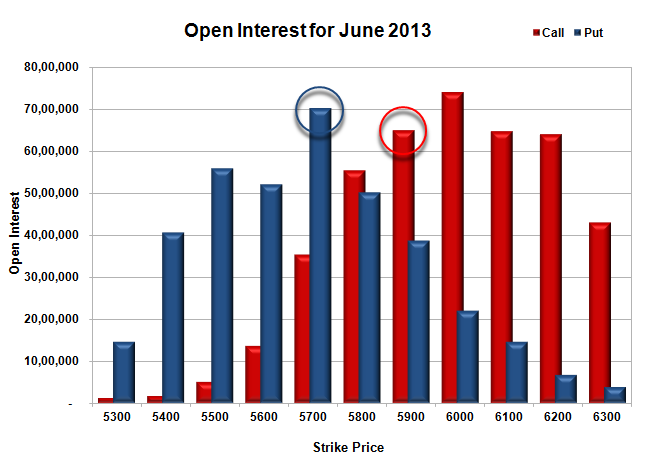 Initial support still very much at 5800, with OI above 68.00 lacs and below that at 5700 with huge OI of 74.24 lacs. 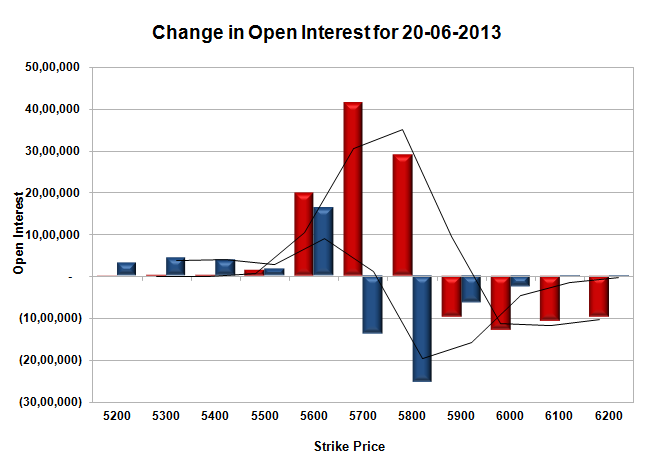 Resistance right now at 5900, with huge OI of 74.64 lacs and above that at 6000 with highest OI of 85.76 lacs. 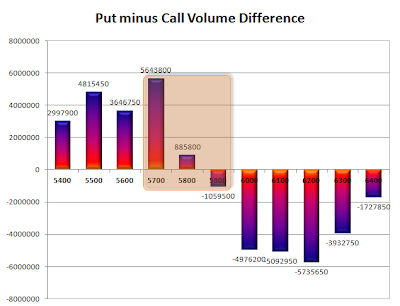 Range as per Option Table is 5763 - 5883 and as per VIX is 5758 - 5869 with 5830 as the Pivot. Nifty opened flat but saw a dip after the Reserve Bank of India (RBI) in its June mid quarter monetary policy left its key policy rate unchanged at 7.25 percent and CRR remained at 4%. The index recouped itself to move above the previous day’s close and stayed strong to close around the highs of the day at 5850.05, a cool gain of 41.65 points. The broader market was positive, with 680 advances to 588 declines. Option Table right now is well balanced between 5800-5900 levels. Call option 5800-6100 added just 9.28 lacs of OI with huge short covering seen at 5700 and below strike price. Put option 5900-5700 added 10.21 lacs huge amount of OI with profit booking seen at 5600 and lower strike prices. Highest accumulation on Call option 6000 at 77.80 lacs & 6100 at 64.55 lacs whereas Put option 5700 at 79.20 lacs & 5800 at 68.04 lacs. Nifty Open Interest is at 1,70,41,700 up by 14,00,250, with increase in price, most probably huge long build-up. 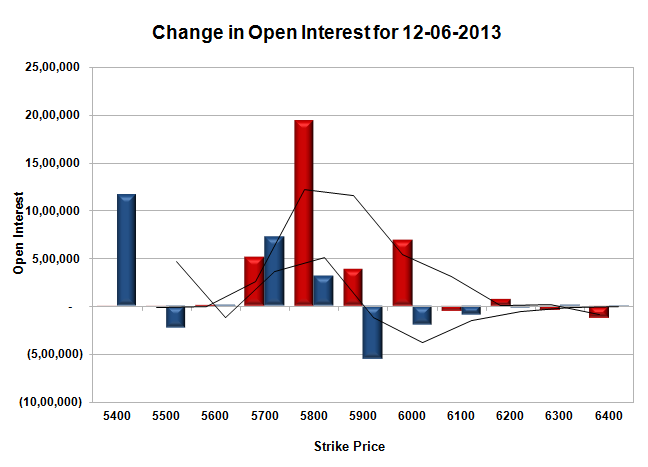 Bank Nifty Open Interest is at 12,61,675, down by 33,325, with increase in price, most probably huge short covering. FII’s sold 5.50 lacs Futures, most probably short build-up, as their net OI increased by 43739 contracts and the average price per contract comes to around 5862. FII’s future open contract as on date is 398263. PCR Open Interest (Volume) is still below danger level at 0.924. Initial support moved up now at 5800, with OI above 68.04 lacs and below that at 5700 with highest OI of 79.20 lacs. Resistance still at 5900, with OI of 59.49 lacs and above that at 6000 with highest OI of 77.80 lacs. 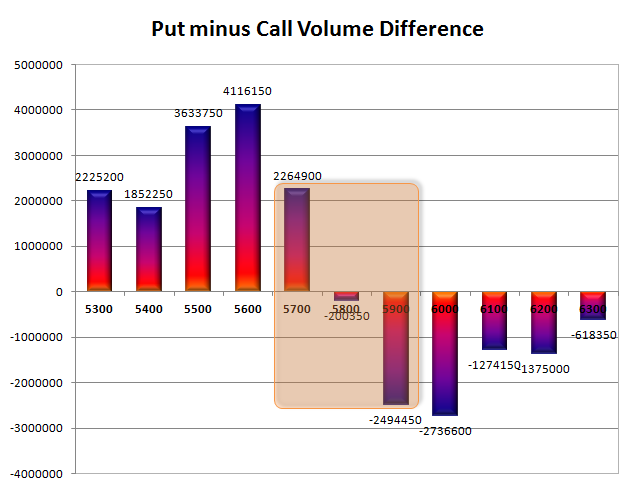 Range as per Option Table is 5772 - 5892 and as per VIX is 5794 - 5906 with 5840 as the Pivot. Nifty after 6 days had a change of fortune, with a positive open on the back of good global cues and then moving up with each trading hour to close near the highs of the day at 5808.40, a huge jump of 109.30 points. On the weekly time frame the index recovered most of the loss of the last 4 days but still closed down by 72.60 points or about 1.23%. The broader market also performed well, with 894 advances to 392 declines. Option Table right now is well balanced around 5800 level with small edge to the PE writers. 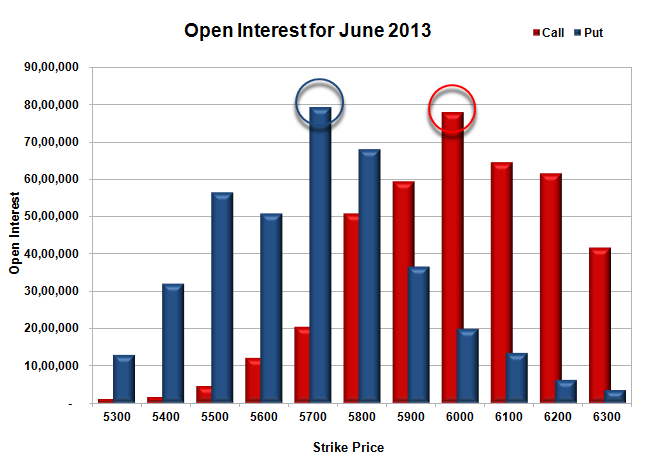 Call option 6000 added just 1.67 lacs of OI with huge short covering seen at 5800 and below strike price. Put option 5800-5500 added 23.11 lacs huge amount of OI with short covering seen at 5900 and above strike prices. Highest accumulation on Call option 6000 at 75.67 lacs & 5900 at 57.67 lacs whereas Put option 5700 at 75.63 lacs & 5800 at 63.13 lacs. Nifty Open Interest is at 1,56,41,450 down by 1,57,300, with increase in price, most probably huge short covering. 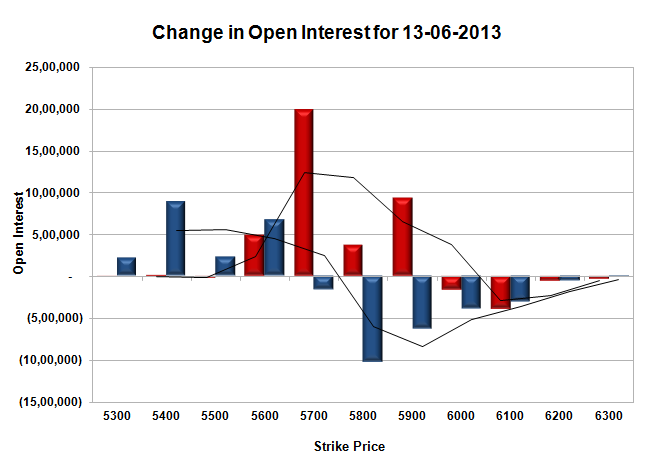 Bank Nifty Open Interest is at 12,95,000, down by 48,175, with increase in price, most probably huge short covering. FII’s bought, yes bought 9.40 lacs Futures, most probably long build-up, as their net OI increased by 1907 contracts and the average price per contract comes to around 5822. FII’s future open contract as on date is 354524. PCR Open Interest (Volume) nudged up a bit to 0.928. Best support at 5700, with OI above 75.63 lacs and below that at 5600 with OI of 56.26 lacs. Resistance right now at 5900, with OI of 57.82 lacs and above that at 6000 with highest OI of 75.67 lacs. 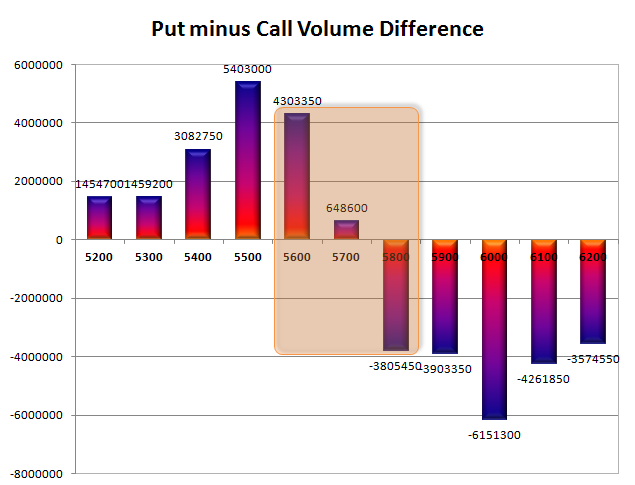 Range as per Option Table is 5734 - 5856 and as per VIX is 5753 - 5864 with 5800 as the Pivot. Nifty opened weak around 5700, and stayed weak with all small up-move sold with ease. Nifty stayed in a narrow range of 47 points and close just below 5700 at 5699.10, a huge loss of 61.10 points for the day and for the week index has lost 181.90 points. The broader market was very bad, with just 321 advances to 962 declines. Option Table range contraction in place, with support still at 5700 and resistance building up around 5800. Call option 5600-5900 added 37.97 lacs huge amount of OI with small profit booking seen at 6000 and above strike price. Put option 5600-5300 added 20.11 lacs huge amount of OI with short covering seen at 5800 and above strike prices. Highest accumulation on Call option 6000 at 74.00 lacs & 5900 at 65.08 lacs whereas Put option 5700 at 70.27 lacs & 5500 at 55.82 lacs. Nifty Open Interest is at 1,57,98,750 up by 12,64,600, with decrease in price, most probably huge short build-up. Bank Nifty Open Interest is at 13,43,175, up by 84,550, with decrease in price, most probably huge short build-up. FII’s sold 8.48 lacs Futures (Approx 1.425 crore futures sold in the last 10 days), most probably short build-up, as their net OI increased by 37297 contracts and the average price per contract comes to around 5721. FII’s future open contract as on date is 352617. PCR Open Interest (Volume) is at the lowest of the series at 0.853. Good support still at 5700 though price hovering around that level, with OI above 70.27 lacs and below that at 5600 with OI of 52.04 lacs. 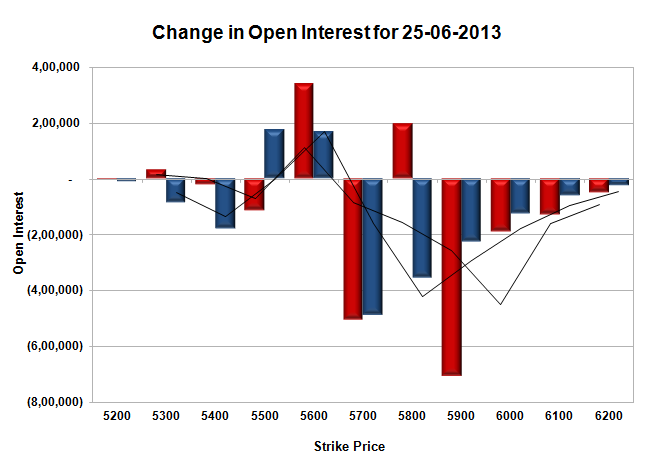 Resistance right now at 5800, with OI of 55.44 lacs and above that at 5900 with huge OI of 65.08 lacs. 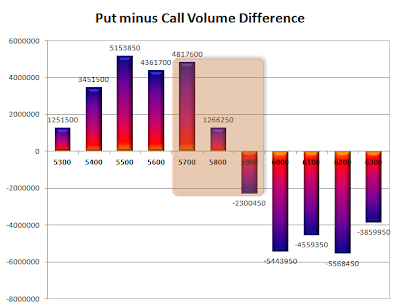 Range as per Option Table is 5644 - 5766 and as per VIX is 5641 - 5757 with 5720 as the Pivot. Nifty opened negative, oscillated within a narrow range of 50, with the high around 5793 and the lows at 5738, but closing in between at 5760.20, a loss of 28.60 points. Nifty was unable to move above the Bull level of 200SMA on intra basis also. The broader market was bad, with just 510 advances to 794 declines. Option Table resistance building up around 5800 with addition of 19.37 lacs for the day. Call option 5700-6000 added 35.30 lacs huge amount of OI with small profit booking seen at 6100 and above strike price. Put option 5800-5600, 5400 added 22.04 lacs huge amount of OI with short covering seen at 5900 and above strike prices. 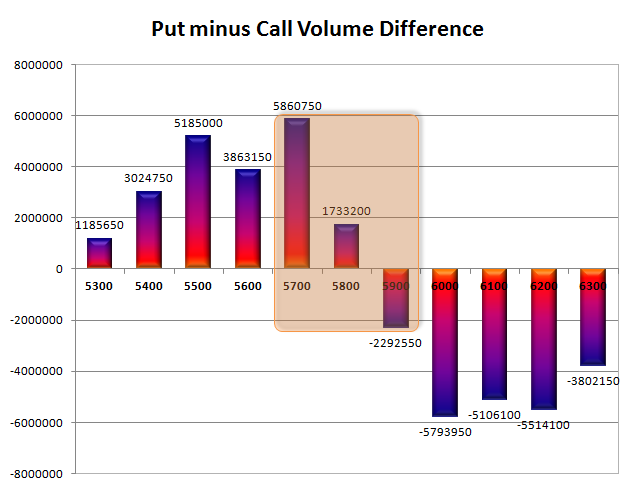 Highest accumulation on Call option 6000 at 75.70 lacs & 6100 at 68.75 lacs whereas Put option 5700 at 71.90 lacs & 5800 at 60.52 lacs. 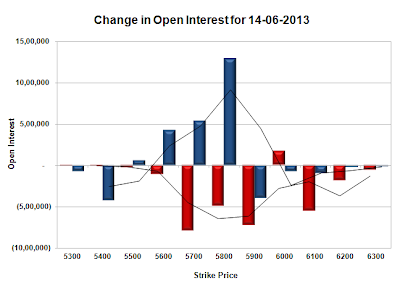 Nifty Open Interest is at 1,45,34,150 up by 9,65,100, with decrease in price, most probably huge short build-up. 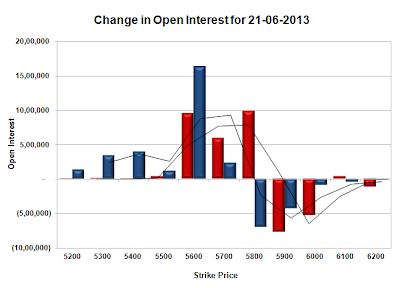 Bank Nifty Open Interest is at 12,58,625, up by 57,650, with decrease in price, most probably huge short build-up. FII’s sold 8.42 lacs Futures (Approx 1.34 crore futures sold in the last 9 days), most probably short build-up, as their net OI increased by 42773 contracts and the average price per contract comes to around 5786. FII’s future open contract as on date is 315320. PCR Open Interest (Volume) is at the low of the series at 0.915. Good support at 5700, with OI above 71.90 lacs and below that at 5600 with OI of just 45.27 lacs. Initial resistance right now at 5800, with huge addition for the day at 19.37 lacs and above that at 5900 with huge OI of 55.73 lacs. 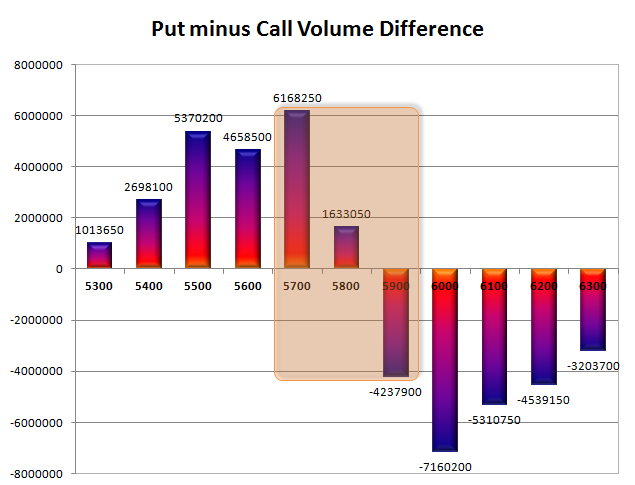 Range as per Option Table is 5705 - 5824 and as per VIX is 5703 - 5817 with 5780 as the Pivot.